Are your girls ready for chapter books and intrigued by other children's lives and dramas? The Totally Twins series is written by Aleesah Darlison, illustrated by Serena Geddes, and published by New Frontier Publishing. It's recommended for readers 9-12, but I have to say that most of them will be girls! These books are ideal for kids who are looking for a fun, fascinating story with a main character that comes to life so much you can "hear" her talking to you. There are two books in the series so far, Totally Twins - Musical Mayhem and Totally Twins - Model Mania. Persephone begins writing her own personal SECRET diary. She is horrified when she has to audition for the school musical and takes comfort in writing down her most SECRET thoughts. The Heartfield Heights Musical Extravaganza soon launches into full swing, much to Persephone’s dismay and her sister Portia’s jubilation. Follow the next hilarious TOTALLY TWINS adventure as Portia sets her sights on a modelling career. 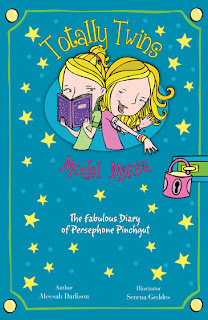 Both books are about the identical-looking twins, Persephone and Portia Pinchgut. Perspehone is the neat one, Portia is the messy one. 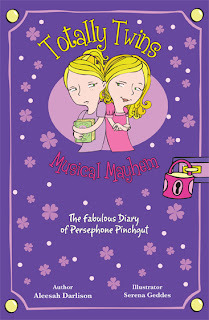 It's Persephone who's actually telling the story through her diary. The girls also have different outlooks on many things which causes conflict in their lives. But at the end of the day, they are twins, sisters and friends, and that is something very special. The series will continue, with Totally Twins - Tropical Trouble due out next, and a fourth in the pipeline. Darlison has created such likeable characters with strong, authentic voices! She obviously understands girls of the target age, the way they feel, the way they speak, and the things that motivate them. But I also like the quirky adults in the twins' lives - Mum, Skye, is a yoga teacher, artist and laughter therapist; Miss Tamarind is their garlic-eating teacher; Grandma is a bungy-jumping travel writer. Perse's commentary on the other characters will make kids laugh, nod their heads in recognition, and perhaps reflect on situations in their own lives. I love what Geddes did with the illustrations. Because these are chapter books, the illustrations are line sketches and serve to highlight certain parts of the story, and break it up so young readers won't be daunted by dense text. The illustrations also seem like sketches the heroine might have added to her actual diaries, and there are even little flowers drawn around the page numbers - very cute, and definitely adding to the attraction of the books. Lots of children gobble up a book series. They love to find one enjoyable book and character(s) and continue with the fictional world an author has created in other books. I think Totally Twins will appeal to such kids, and makes a popular choice for home, school or public libraries.